TE Benjamin Watson vs. LB Anthony Barr – Watson’s matchup this week will be against Barr, whose coverage grade of 83.0 ranks ninth among linebackers. Watson has only had two weeks this season with an above average receiving grade, and after a strong start he has seen his overall grade drop to 68.9. He was busy last game with seven targets and six receptions, though for just 28 yards, Watson will see if he can do more with his opportunities against Barr, who has allowed 20 receptions on 22 targets this season. 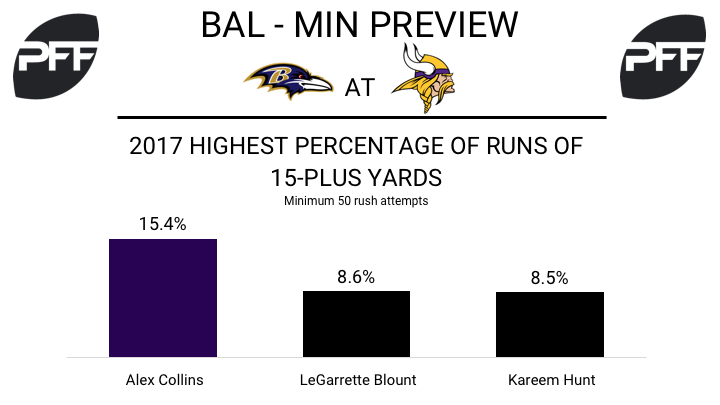 RB Alex Collins vs. LB Eric Kendricks – Collins has become the most dangerous back in the Ravens backfield, having recorded at least one run of 15-plus yards in every game he’s played in this season. Kendricks ranks just 20th of 27 inside linebackers (min. 100 run snaps) in run-stop percentage, with a mark of 7.1 percent (10 stops on 141 run snaps). His three missed tackles in run defense are tied for sixth most among all inside linebackers. QB Joe Flacco vs. S Harrison Smith – This week Flacco takes on a defense led by PFF’s highest graded safety. Smith has been outstanding in coverage, having allowed just six of 16 targets to be completed for 35 yards and three interceptions (6.3 passer rating). After struggling to get his deep passing going to start the season, Flacco now has an adjusted completion percentage of 46.7 percent on throws of 20-plus yards this year. He also, however, is tied for the league lead in interceptions on deep passes (3). 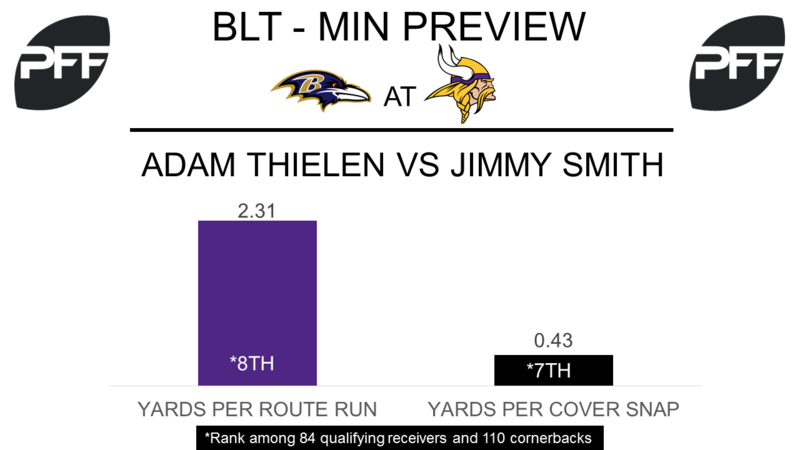 WR Adam Thielen vs. CB Jimmy Smith – Thielen has been superb for the Vikings in 2017, his PFF overall grade of 83.4 is the eighth best by a receiver this season. He is productive running his routes as his 2.31 yards per route run ranks eighth this season. On most downs Thielen will find himself going up against cornerback Jimmy Smith, whose performances this season have been much improved from the previous seasons. His overall PFF grade of 82.8 is his highest in the last two seasons and ranks 25th among qualifying cornerbacks. Smith could limit Thielen’s production as he is only allowing 0.43 yards per cover snap, seventh best in the NFL. RB Jerick McKinnon vs. LB C.J. Mosley – Since the injury to rookie runner Dalvin Cook, McKinnon has been getting the bulk of the carries and has so far done an excellent job in replacing him. Over the last two weeks McKinnon has earned a breakaway percentage of 47.6, the sixth best by a runner in that span, and he has had game grades of 84.8 in Week 5 and 68.5 in week 6. Mosley has been one of the best run-stopping linebackers this season, as he leads the NFL with 20 stops in run defense. His run-stop percentage of 10.8 also ranks inside the top 20 (a run stop is a tackle made in run defense that results in a “WIN” for the defense). T Riley Reiff vs. Edge Terrell Suggs – This will be a great matchup in the run game Sunday, Reiff has been a lot stronger in the run game than the pass game this season, his run-block grade of 81 ranks 16th among 67 qualifying offensive tackles this season. He will face off against one of the best edge defenders against the run in Terrell Suggs, whose run-defense grade of 87.5 is the seventh best among edge defenders this season.